Abu Hibbaan Kamran Malik, Abu Khuzaimah Imran Masoom, Abu Alqama Ali Hassan Khan and the self-styled Hanafi-Athari-Sufi, Abu Turab Ali Rida Qadri. It also addressed indirectly other diatribes made by other members of pseudo-Salafism on some forums and websites in recent times. The response is in excess of 400 pages and it is replete with original references as well as responses to most of the major claims by the detractors of this narration, insha Allah. 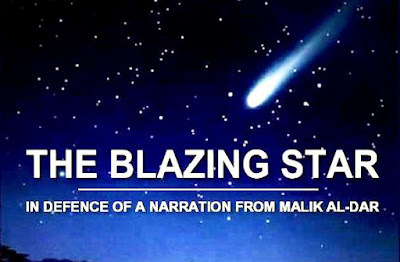 3) Malik al-Dar is not unknown (majhul), but should be considered as a type of reliable narrator based on the expressions quoted from al-Bukhari, Ibn Sa’d, Ibn Hibban and al-Khalili. 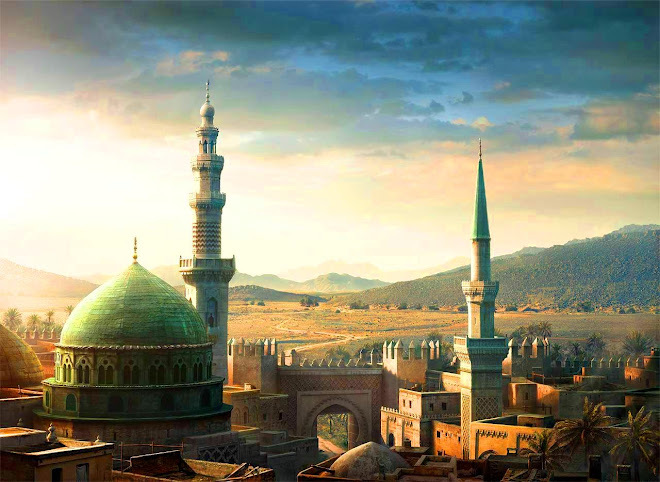 While he is known as a Tabi’i, some like al-Dhahabi and ibn Fahd considered him to be a Sahabi. 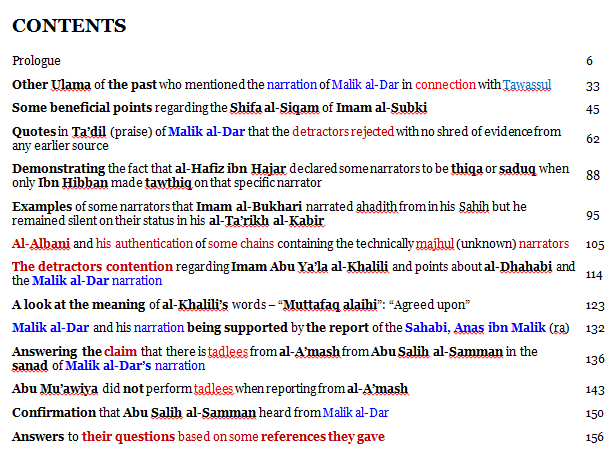 5) No one from the reputable Hadith scholars or jurisprudents of the past was named by the detractors to have weakened the narration from Malik al-Dar. They took their cue from the late Nasir al-Albani (d. 1999) and those who are from the same mentality in creed or jurisprudential approaches in this age after him, like Zubair Ali Za’i et al. 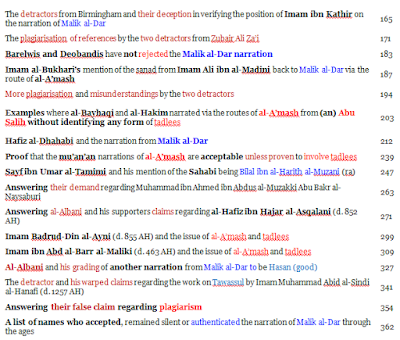 7) Despite al-Albani weakening this specific narration from Malik al-Dar mentioned above, it is surprising to note that al-Albani has also declared another narration via the route of Malik al-Dar to be Hasan (good) in his editing of Imam al-Mundhiri’s (d. 656 AH) al-Targhib wal Tarhib. I understood that You would not place next to Your Name but the Most Beloved One of Your creation. Allah said: O Adam, I have forgiven you, and were it not for Muhammad I would not have created you." First the above Hadith was declared sound by many of the scholars of Hadith despite their knowledge of the presence of a problematic narrator in its chain by the name of Abd al-Rahman ibn Zayd ibn Aslam. Now, even if we accept the grading given to this Hadith by the "salafis" [something which many of the reliable scholars of the past have disagreed with them upon as demonstrated below] then still, as explained by Sh. GF Haddad the narration through Abd al-Rahman ibn Zayd is not actually the most authentic chain for this report! Rather, the Hadith narrated by Maysarat al-Fajr RA [Hadith below] is the most authentic chain for this report [declared by Sh. Abdullah al-Ghumari as "good and strong"]. 1. This hadith is declared sound (sahih) by al-Hakim in al-Mustadrak (2:651), although he acknowledges Abd al-Rahman ibn Zayd ibn Aslam, one of its sub-narrators, as weak. However, when he mentions this hadith he says: "Its chain is sound, and it is the first hadith of Abd al-Rahman ibn Zayd ibn Aslam which I mention in this book"; al-Hakim also declares sound another version through Ibn `Abbas. 2. al-Bulqini declares this hadith sound in his Fatawa. 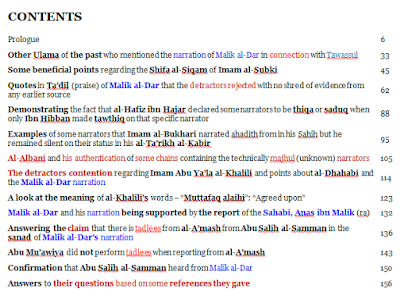 3. al-Subki confirms al-Hakim's authentication (in Shifa' al-siqam fi ziyarat khayr al-anam p. 134-135) although Ibn Taymiyya's rejection and criticism of this hadith was known to him and he rejects it, as well as saying that Ibn Taymiyya's extreme weakening of Ibn Zayd is exaggerated. 4. The hadith is also included by Qadi `Iyad among the "sound and famous narrations" in al-Shifa, and he says that Abu Muhammad al-Makki and Abu al-Layth al-Samarqandi mention it; Qadi `Iyad says: "It is said that this hadith explains the verse: 'And Adam received words from his Lord and He relented towards him' (2:37)"; he continues to cite another very similar version through al-Ajurri (d. 360), about whom al-Qari said: "al-Halabi said: This seems to be the imam and guide Abu Bakr Muhammad ibn al-Husayn ibn `Abd Allah al-Baghdadi, the compiler of the books al-Shari`a devoted to the Sunna, al-Arba`un, and others.'" This is confirmed by Ibn Taymiyya in his Qa`ida fi al-tawassul: "It is related by Shaykh Abu Bakr al-Ajurri, in his book al-Shari`a." 5. Ibn al-Jawzi also considers it sound (sahih) as he cites it in the first chapter of al-Wafa bi ahwal al-mustafa, in the introduction of which he says: "(In this book) I do not mix the sound hadith with the false," although he knew of `Abd al-Rahman ibn Zayd's weakness as a narrator; he also mentions the version of Maysarat al-Fajr whereby the Prophet says: "When satan deceived Adam and Eve, they repented and sought intercession to Allah with my name"; Ibn al-Jawzi also says in the chapter concerning the Prophet's superiority over the other Prophets in the same book: "Part of the exposition of his superiority to other Prophets is the fact that Adam asked his Lord through the sanctity (hurmat) of Muhammad that He relent towards him, as we have already mentioned." 7. Ibn Kathir mentions it after Bayhaqi in al-Bidayat wa al-Nihaya (1:75, 1:180). 8. al-Haythami in Majma` al-zawa'id (8:253 #28870), al-Bayhaqi himself, and al-Qari in Sharh al- shifa' show that its chains have weakness in them. However, the weakness of Abd al-Rahman ibn Zayd was known by Ibn al-Jawzi, Subki, Bayhaqi, Hakim, and Abu Nu`aym, yet all these scholars retained this hadith for consideration in their books. 9. Three scholars reject it, such as Ibn Taymiyya (Qa`ida jalila fi al-tawassul p. 89, 168-170) and his two students Ibn `Abd al-Hadi (al-Sarim al-munki p. 61-63) and al-Dhahabi (Mizan al-i`tidal 2:504 and Talkhis al-mustadrak), while `Asqalani reports Ibn Hibban's saying that `Abd al-Rahman ibn Zayd was a forger (Lisan al-mizan 3:360, 3:442). "These two are like the elucidation (tafsir) of the authentic ahadith (concerning the same topic)" (Fatawa 2:150). The contemporary Meccan hadith scholar Ibn `Alawi al-Maliki said: "This indicates that Ibn Taymiyya found the hadith sound enough to be considered a witness for other narrations (salih li al-istishhad wa al-i`tibar), because the forged (al-mawdu`) and the false (al-batil) are not taken as witness by the people of hadith"; al-Maliki also quotes (without reference) Dhahabi's unrestrained endorsement of the ahadith in Bayhaqi's Dala'il al-nubuwwa with his words: "You must take what is in it (the Dala'il), for it consists entirely of guidance and light." (Mafahim yajib an tusahhah p. 47). Muhammad is the Chief of the Children of Adam, the Best of Creation, the noblest of them in the sight of Allah. This is why some have said that "Allah created the Universe due to him," or that "Were it not for him, He would have neither created a Throne, nor a Footstool, nor a heaven, earth, sun or moon." Since the best of the righteous of the children of Adam is Muhammad, creating him was a desirable end of deep-seated purposeful wisdom, more than for anyone else, and hence the completion of creation and the fulfilment of perfection was attained with Muhammad, may Allah Exalted bless him and grant him peace... The Chief of the Children of Adam is Muhammad, may Allah Exalted bless him and grant him peace, Adam and his children being under his banner. He, may Allah Exalted bless him and grant him peace, said: "Truly, I was written as the Seal of the Prophets with Allah, when Adam was going to-and-fro in his clay," i.e. that my prophethood was decreed and manifested when Adam was created but before the breathing of the Spirit into him, just as Allah decrees the livelihood, lifespan, deeds and misery or happiness of the slave when He creates the embryo but before the breathing of the Spirit into it. Since man is the seal and last of all creation, and its microcosm, and since the best of man is thus the best of all creation absolutely, then Muhammad, being the Pupil of the Eye, the Axis of the Mill, and the Distributor to the Collective, is as it were the Ultimate Purpose from amongst all the purposes of creation. Thus it cannot be denied to say that "Due to him all of this was created", or that "Were it not for him, all this would not have been created," so if statements like this are thus explained according to what the Book and the Sunna indicate, it is acceptable. 12. Its latter part is mentioned as a separate hadith in the wording: "Were it not for Muhammad, I would not have created the spheres (al-aflak)." al-`Ajluni said in Kashf al-khafa' (#2123): "al-Saghani (d.650) said it is forged. I say: but its meaning is correct." 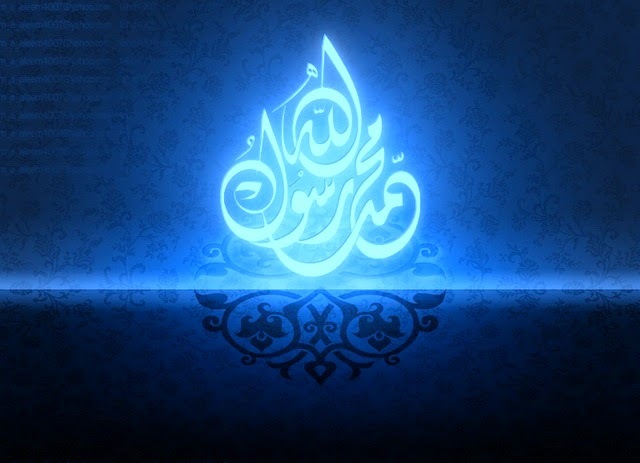 "al-Saghani (in al-Ahadith al-mawdu`a p. 7) said: "It is forged," however, its meaning is sound (mi`nahu sahih), as Daylami has narrated on the authority of Ibn `Abbas that the Prophet said: "Gabriel came to me and said: O Muhammad! Were it not for you, Paradise would not have been created, and were it not for you, the Fire would not have been created." 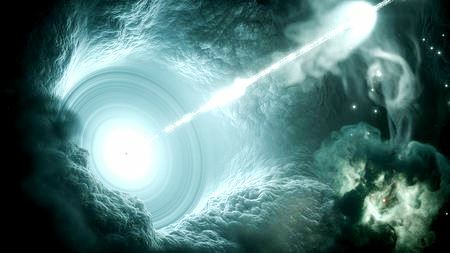 And Ibn `Asakir's narration has: And were it not for you, the world would not have been created." 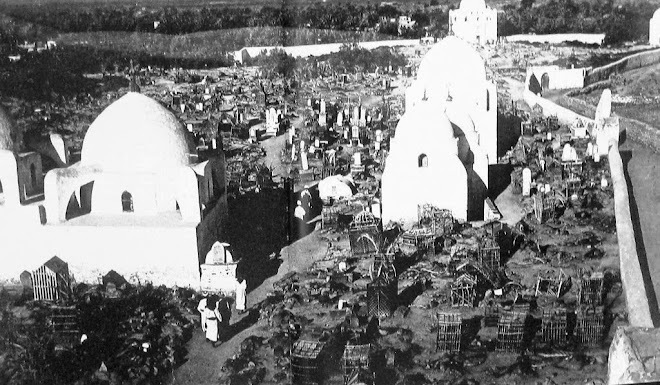 As for Albani's rejection of Qari's use of Daylami in support of the hadith with the words: "I do not hesitate to declare it weak on the basis that Daylami is alone in citing it" (Silsila da`ifa #282), it shows exaggeration and deviation from the practice of the scholars concerning Daylami and his book. Ibn Taymiyya said in Minhaj al-sunna (4:38): "The fact that Daylami alone narrates a hadith does not indicate that the hadith is sound." Note that he never said: "The fact that Daylami alone narrates a hadith indicates that it is forged," yet this is what Albani concludes! The reader may compare Albani's method of apriori rejection in lieu of a discussion of the hadith itself, to Ibn Hajar al-`Asqalani's reliance on a hadith narrated by Daylami, as is shown by hadith #33 of his Arba`un fi rad` al-mujrim `an sabb al-muslim, although Daylami is alone in citing it. Further in Minhaj al-sunna (4:78) Ibn Taymiyya declared of him and his book: "al-Daylami in his book al-Firdaws mentioned many sound (sahih) hadiths, and also fair (hasan) narrations and forged ones.... He was one of the people of knowledge and religion and he was not a liar." If Allah created all the universes for the sake of human beings, then how could all humanity be given what the Prophet is grudged, who is better than mankind and jinn put together? What follows now is the discussion of another related Hadith narrated through Maysarat al-Fajr [RA] cited below in Arabic with its chain of narrators. I asked: "O Messenger of Allah, when were you [first] a Prophet?" 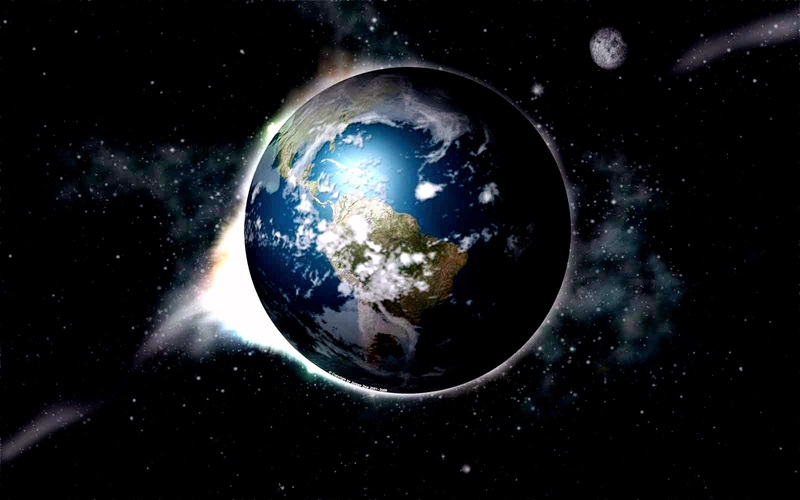 He replied: "When Allah created the earth ‘Then turned He to the heaven, and fashioned it as seven heavens’(2:29), and created the Throne, He wrote on the leg of the Throne: "Muhammad the Messenger of Allah is the Seal of Prophets" (Muhammadun Rasûlullâhi Khâtamu al-Anbiyâ'). Then Allah created the Garden in which He made Adam and Hawwa' dwell, and He wrote my name on the gates, its tree-leaves, its domes and tents, at a time when Adam was still between the spirit and the body. 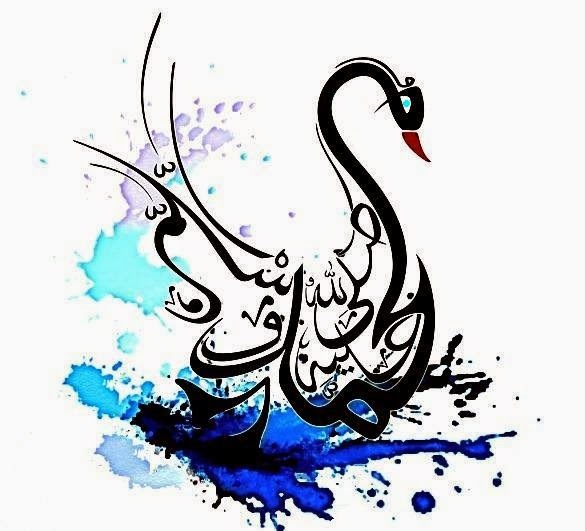 When Allah Most High instilled life into him he looked at the Throne and saw my name, whereupon Allah informed him that 'He [Muhammad SAWS] is the liege-lord of all your descendants.' When Satan deceived them both, they repented and sought intercession to Allah with my name." In the chapter concerning the Prophet's superiority over all other Prophets in his great book titled al-Wafa bi Ahwal al-Mustafa', Ibn al-Jawzi states: "Part of the demonstration of his superiority to other Prophets is the fact that Adam (AS) asked his Lord through the sanctity (hurma) of Muhammad (S) that He relent towards him." Shaykh `Abd Allah al-Ghumari cited it in Murshid al-Ha'ir li Bayan Wad` Hadith Jabir and said, "its chain is good and strong" while in al-Radd al-Muhkam al-Matin (p. 138-139) he adds: "It is the strongest Companion-corroboration (shâhid) I saw for the hadith of `Abd al-Rahman ibn Zayd" as quoted also by Shaykh Mahmud Mamduh in Raf` al-Minara (p. 248). 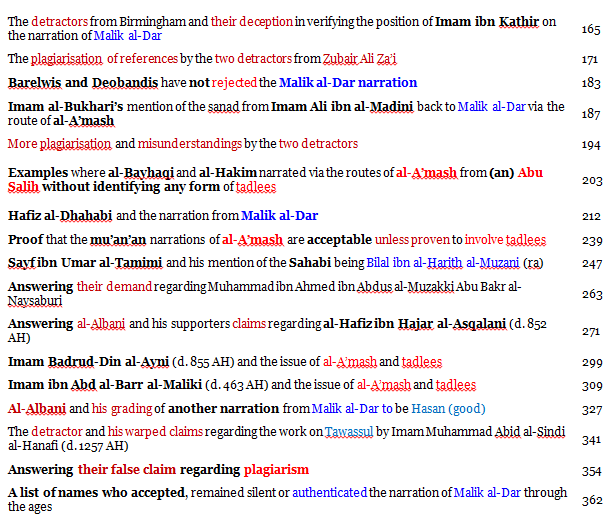 "The chain of narrators for this Hadith is totally different from the previous one. And in fact, Hafiz ibn Hajar [ra] has stated concerning a completely different narration which has the very same chain of narrators, that this chain of narrators is strong. (al-Raddul Muhkamul Mateen pgs.138-139; al-Ahaadeethul Muntaqaa pg.14, both of Shaykh Abdullah Siddique al-Ghumarie)"
Meaning: "Good and there is no harm in it." This earlier ruling gives credibility to Shaykh Abdullah al-Ghumari and his student: Shaykh Mahmud Mamduh's declarations on its authenticity. Note also, that Shaykh Abdullah al-Ghumari has also declared in his Al-Ahadith al-Muntaqa fi-Fada'il Rasul Allah (sallallahu alaihi wa sallam) that the narration from Maysara (ra) is "Qawi" - "Strong"
Some contemporaries have objected of late that in the sanad to the narration from Ibn Bushran there is a narrator by the name of Muhammad ibn Salih - and it is not precisely known which of the numerous Muhammad ibn Salih's is this exact one in the Isnad given above. Shaykh Mamduh has named two that could possibly be the exact narrator in the above sanad. Basically it may be the Muhammad ibn Salih known as Abu Bakr al-Anmati who he said was a trustworthy Hafiz (Thiqa Hafiz, as In Taqreeb al-Tahdhib of Ibn Hajar, no. 5962) or it may be Muhammad ibn Salih al-Wasiti Ka'b al-Zaari who was declared Thiqa by Khatib al-Baghdadi in his Ta'rikh (5/360). The objection stems from not having direct evidence if any of these narrators commonly known as Muhammad ibn Salih did actually meet and narrate from the next narrator in the Isnad known as: Muhammad ibn Sinan. The answer Insha'allah: Most of our contemporaries, like the late Shaykh Abdullah al-Ghumari and his students like Shaykh Mamduh seem to have missed or not known of another alternative route which was also related by Imam Ibn Bushran, with the crucial point of Muhammad ibn Salih not being in an alternative route containing the same text! Maysara al-Fajr with the same text as Ibn Taymiyya mentioned from Hafiz ibn al-Jawzi. وأخبرنا أبو الحسين بن بشران ببغداد قال : حدثنا أبو جعفر محمد بن عمرو الرزاز قال : حدثنا أحمد بن إسحاق بن صالح قال : حدثنا محمد بن سنان العوقي قال : حدثنا إبراهيم بن طهمان عن بديل بن ميسرة عن عبد الله بن شقيق عن ميسرة الفجر قال : قلت : يا رسول الله متى كتبت نبيا ؟ قال : " وآدم بين الروح والجسد "
Insha'allah, this should give strength to the route containing Muhammad ibn Salih in the initial part of the discussion above. If anyone has an objection to the sanad given by Imam al-Marakashi then they need to show why using Ilm al-Jarh wa Ta'dil of the narrators.